I’m not going to lie – when the invite to the screening of Wild Rose popped into my inbox, and I saw the title, the first thing that popped into my head was the Nick Cave/Kylie duet, and it stuck there for days! So it didn’t exactly endear itself to me. Thankfully, this is full of songs that will erase and replace any annoying ear-worm you might find stuck in your brain. Most people will remember Jessie Buckley from the Andrew Lloyd Webber star search, I’d Do Anything, where she belted out show tunes on a weekly basis. Here, she turns her hand to country – because it’s “three chords and the truth”. She plays Rose-Lynn Harlan, an aspiring country star, who is trying to get her ambitions back on track after a stint in jail. However, her two young children, and the demands of caring for them, somewhat scupper her plans, and she’s forced to take a cleaning job for the wealthy Susannah (Okonedo). Despite her reticence it turns out to be fortuitous, as Susannah hears her sing, and uses her connections to get her a meeting with the legendary Bob Harris in the BBC. In awe of Rose’s talent, Susannah quickly becomes somewhat of a mentor for her, and determines to help her follow her dream to get to Nashville, so she can become the country star she always dreamed of being. I hate using the phrase that the performance was “a revelation”, but in this case it is completely justified regarding Buckley. She is amazing as Rose, and truly shines in the scenes where she is singing. Obviously, she is helped by an extremely strong supporting cast, and she more than holds her own against stage and screen stalwarts, Walters and Okonedo, who are both fabulous. It’s actually lovely to see such a female-centric film that isn’t pushing a feminist agenda. It just happens to feature lots of strong women. Some parts of the script feel rather contrived, and jolt you out of the story somewhat. The trip to London to meet Bob Harris could probably have been removed entirely, and made little difference to the plot. However, even in those moments, Wild Rose has a huge amount of heart and ambition – much like its protagonist. You don’t have to be a country fan to enjoy the songs – all of which are infuriatingly catchy. Indeed, you might start to see the genre in a new light after watching this. The soundtrack is made up of a mixture of well-known country tracks and original numbers, and the new works are so good it is difficult to tell which ones you haven’t heard before. The closing track, No Place Like Home, has the potential to be an instant classic. 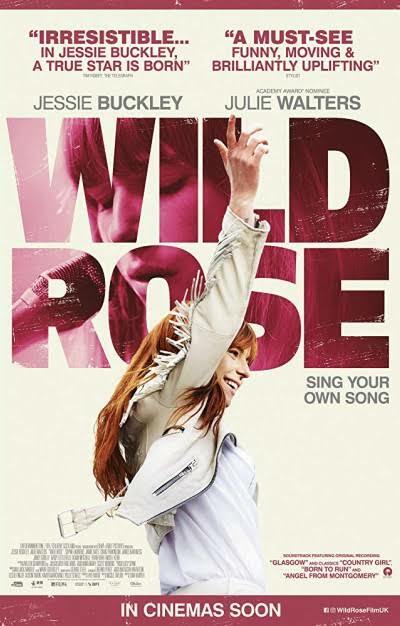 I’ve seen some reviews comparing Wild Rose to A Star Is Born, but I don’t agree. It is actually its polar opposite. Instead of Hollywood glitz, it has a gritty greyness about it that it wears with pride. Wile Rose has no gimmicks – it is simply a solid drama that wears its heart on its sleeve. It will move you and manipulate your emotions, and leave you feeling drained but uplifted. Entertaining and engaging, Wild Rose is good old-fashioned kitchen sink drama, with a cracking soundtrack thrown in as an added bonus. And if you don’t see Jessie Buckley everywhere after this, there is no justice. ← Competition: Win Tickets to ‘A Day in May’ @ The Pavilion Theatre!